As the NCAA regular season winds down, there’s still multiple teams in the mix for “At-Large” bids in the NCAA Tournament this year. For a conference like the A-10 — this is great. Postseason suspensions of the Louisville Cardinals and SMU Mustangs have opened up two more spots for tournament hopefuls outside of the power five conferences. While the A-10’s play this season solidifies its spot as one of the top conferences outside of the power five in college basketball, it doesn’t guarantee four or more At-Large bids like the ACC or Big-12. Outside of the Dayton Flyers, no other team in the conference is a lock to make the tournament as of right now. 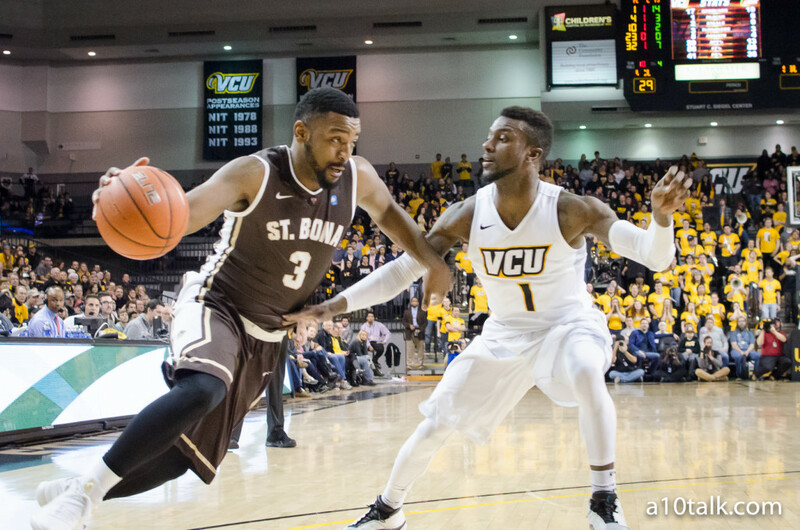 Out of the field, the St. Joseph’s Hawks have the next best shot, followed by the VCU Rams, St. Bonaventure Bonnies and the George Washington Colonials. While the best way to punch your ticket to the big dance is winning the A-10 tournament, obviously, only one team can. Therefore, the A-10’s bubble teams need other bubble teams to lose in order to get into the tournament. With that, let’s take a look at a few matchups this weekend that could affect the bubble teams in the A-10. The Commodores came into the year as a team not expected to be on the bubble. However, they dropped close games to top-notch competition in the Kansas Jayhawks, Baylor Bears and the A-10’s own, Dayton Flyers. Then, close losses to the likes of the Arkansas Razorbacks and LSU Tigers further hurt their chances on making the tournament. Not to mention their top win before February was against the Florida Gators, a team destined for the 8th/9th seed. However, things turned around in February with the Commodores beating the then top-10 Texas A&M Aggies, and winning all but two games in February so far. While it’s likely the committee expects the Commodores to lose to powerhouse Kentucky, a win over the Wildcats would give the Commodores a guaranteed At-Large bid, especially with the Tennessee Volunteers and a rematch against the Aggies on the horizon, two teams that wouldn’t hurt the Commodores chances too much if they happened to lose one of the two. The Bulldogs usually aren’t in the bubble conversation — at least, not in recent history. However, losses to the Creighton Jays and Marquette Golden Eagles have put the Bulldogs in a tough situation. The Bulldogs can’t afford anymore losses — especially to inferior completion. The Georgetown Hoyas have had an uncharacteristically mediocre season. Sitting at .500, the Hoyas have not played up to standard this season. However, they have proven to be a dangerous team with wins over likely tournament teams such as the Syracuse Orange, Wisconsin Badgers (in one of the worst college basketball games I’ve ever seen), and the Xavier Musketeers. With the Bulldogs still having a difficult season finish, Seton Hall Pirates and a tough season-finale against Marquette on the docket, a loss to the Hoyas would put Chris Holtmann’s squad in serious jeopardy of missing the tournament — opening up a spot for an A-10 team on the bubble. The Golden Hurricanes have been teetering in the “in-or-out” conversation for quite some time. On one hand, wins over the Wichita State Shockers, UConn Huskies, and SMU Mustangs prove they can play with good competition. On the other hand, losses to the Houston Cougars and Oral Roberts Golden Eagles show their susceptibility to being beat by less-than-quality competition. The Golden Hurricanes are currently one of ESPN Bracektologist Joe Lunardi’s “last four in.” However, a loss to the underachieving Memphis Tigers would likely catapult an A-10 team into their spot. This one is simple. If the Huskies lose, they are out. If they win, they could likely boast a resume that gets them in the “First Four” of the tournament. The Huskies have had a crazy season — further personified by the “buzzer-beater that was actually a foul” after Oregon State’s Stephen Thompson Jr. appeared to travel on a game-winning shot over the Huskies. Unfortunately, the officials missed the call and the Huskies chances of making the tournament now hinge on beating the top-25 ranked Oregon Ducks. If the Ducks take care of business at home— then the Huskies will be out of the At-Large bid conversation. However, if the Huskies upset the Ducks — then another At-Large spot becomes in jeopardy. Josh Svetz is a sophomore at St. Bonaventure University studying journalism and mass communications. Josh has previously worked for Steelersdepot.com, FFlockeroom.com and Fansided.com. He also writes for the online student newspaper, The Intrepid, occasionally announces games for SBU men's and women's basketball on A-10 Network and hosts his own radio show on his school's student-run radio station, 88.3 The Buzz, " The Lounge", where he plays the latest hip-hop mixed with sports talk featuring guest correspondents. You can follow him @svetz17 for additional thoughts on sports and whatever else is on his mind.